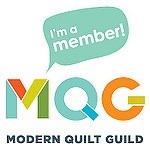 It’s February which means it’s almost time for QuiltCon, the Modern Quilt Guild’s annual show and convention. I thought I’d share the backstory of, “At the Junction”, which will be on display in Nashville. 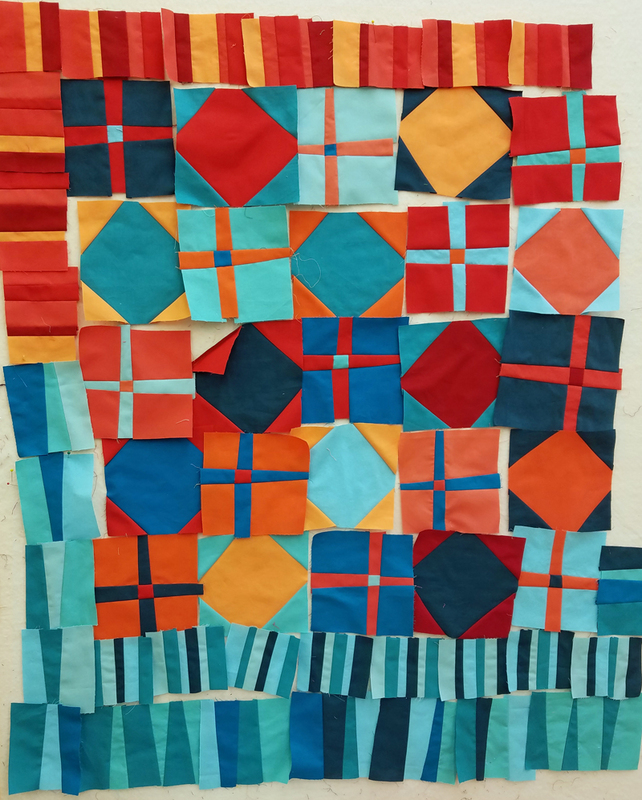 Back in May, I took a Free-Form Blocks workshop from Sujata Shah at Quilted Strait. 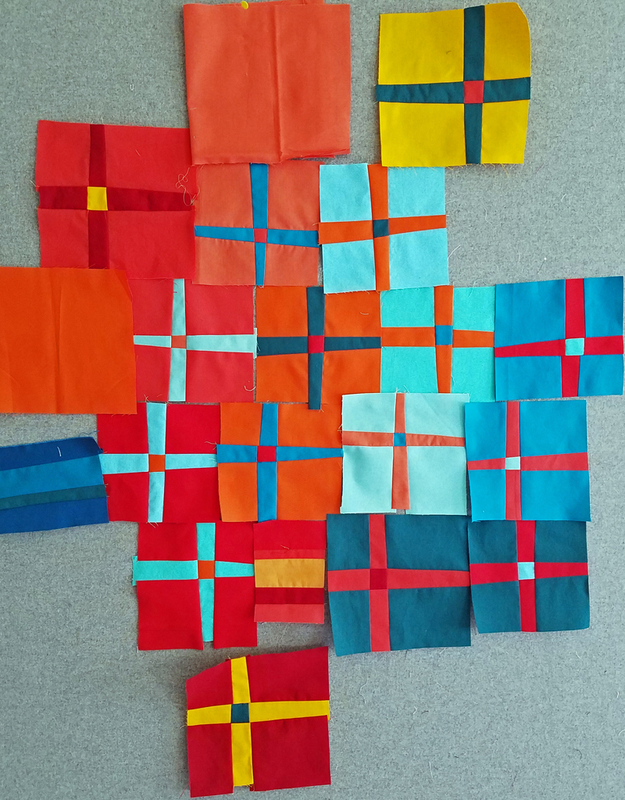 We explored Sujata’s method of cutting several layers of fabric to construct a variety of unique blocks. 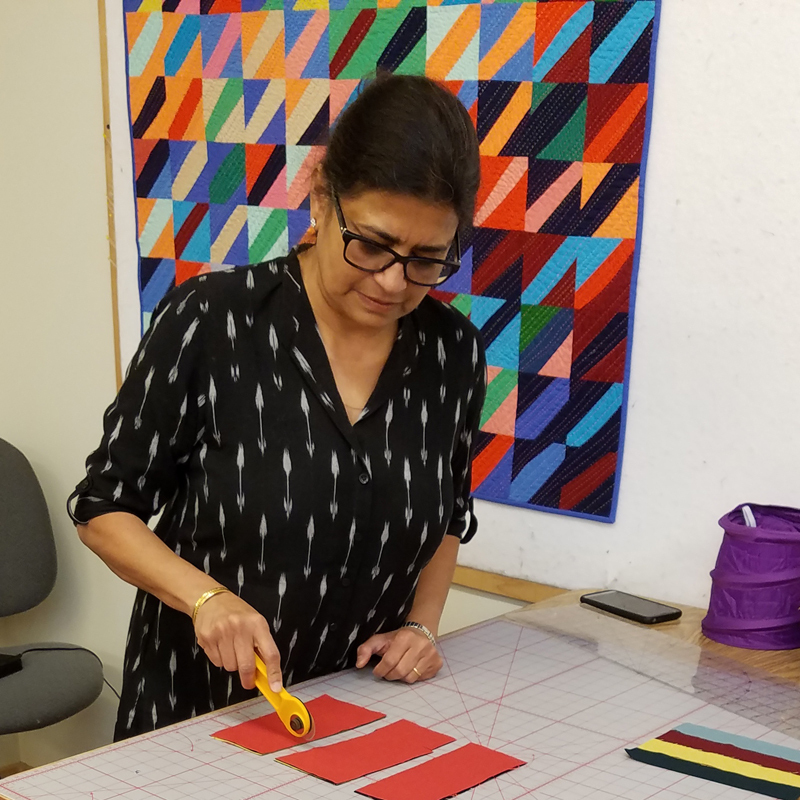 I was looking for some faster improv techniques, as well as to spending time with Sujata and her gorgeous, colorful quilts. 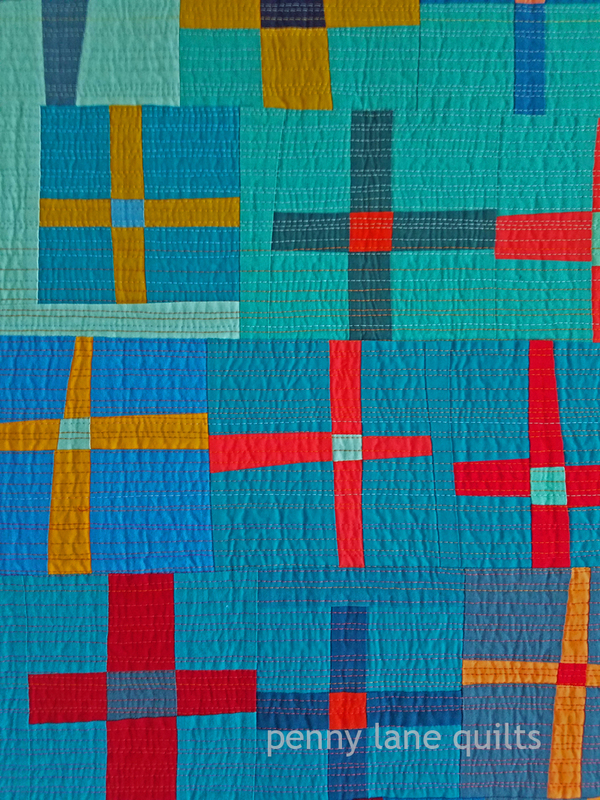 Her book, Cultural Fusion Quilts: a Melting Pot of Piecing Traditions, is a wonderful resource if you want to learn more. 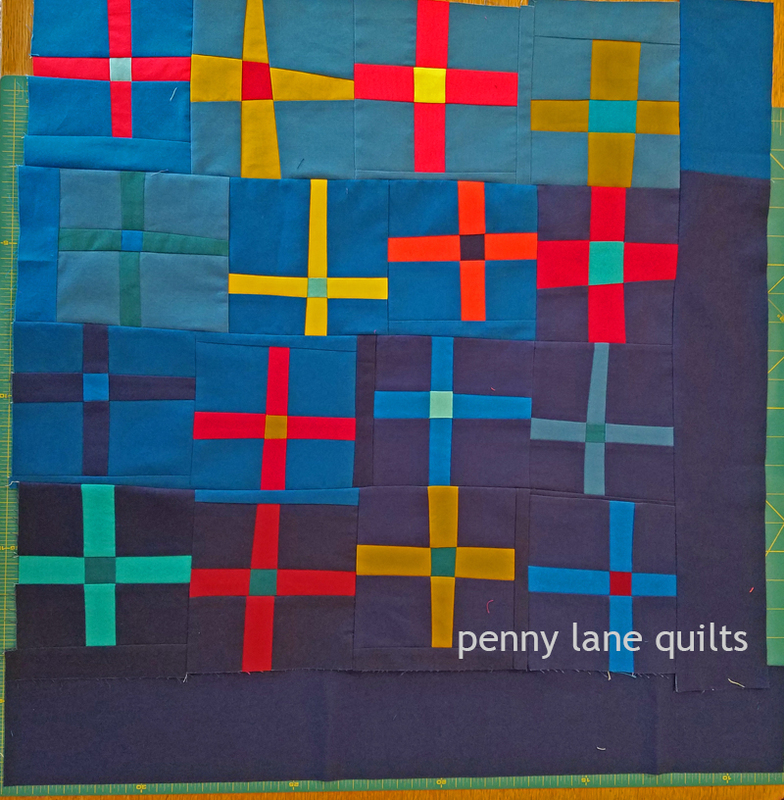 However, the block that captured my attention was this one, so when I came home, I separated these out and they became the starting point of a new quilt. I decided to go with the primary colors and kept making blocks (they were rather addictive and I needed some improv therapy time). Before I knew it, the design wall was full. 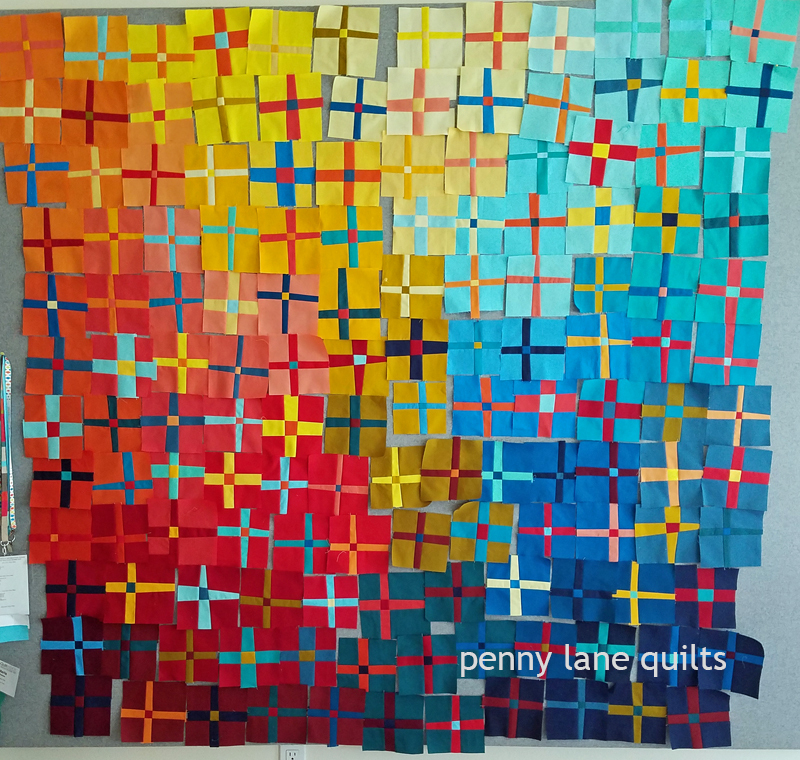 This was the end of September and I began to think it might be possible to make the QuiltCon entry deadline of November 30. At this junction (see what I did there?) I needed to make a decision whether to square these blocks up before assembling or to do my usual freehand cutting and puzzling the units together. It had grown larger than any of my other improv pieces and I knew it would be a challenge, but my cheerleaders over on IG encouraged me to not take the easy road! I pieced it in sections, adding a “safe zone” around the edges so that I wouldn’t lose any of the blocks when I trimmed up the finished top. 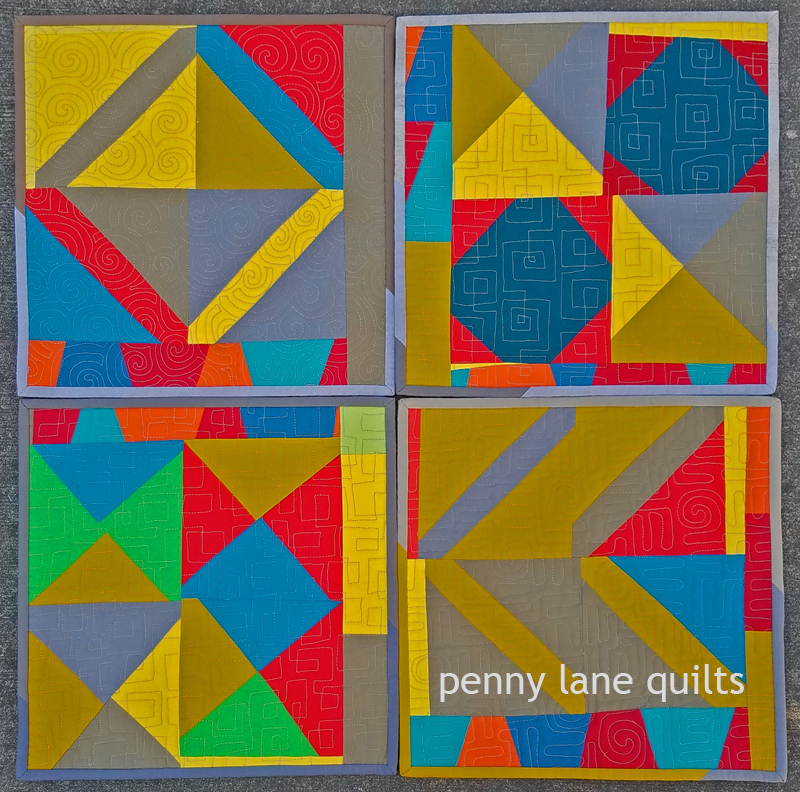 By the middle of November, I had the top pieced, basted and ready to quilt. This was the largest quilt I have machine quilted and I had doubts about tackling it on my domestic machine. 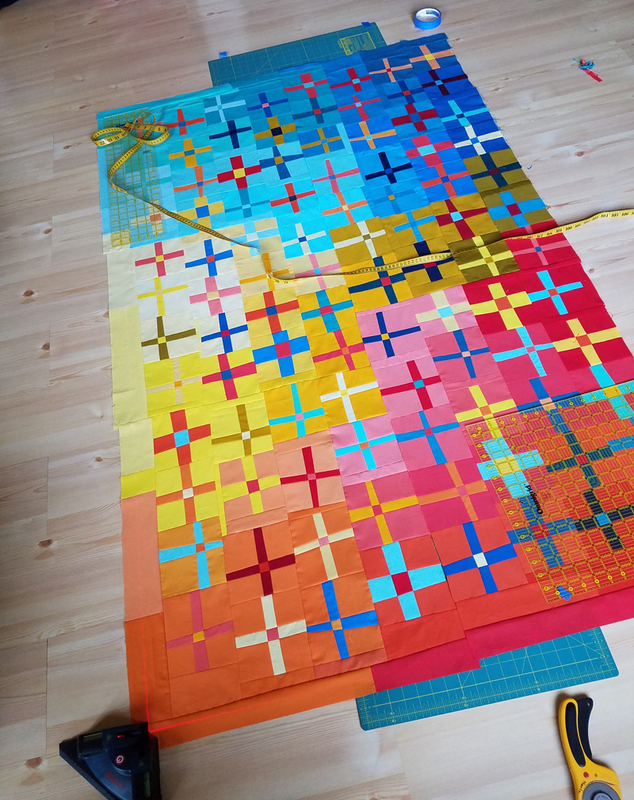 Originally I planned to quilt it about half an inch apart, but before I knew it, I started quilting much closer than that! It was a lot of wrestling and wrangling, and some long hours at the machine. It took almost seventy hours to quilt and I used ten different colors of Aurifil 50 wt. The thread colors graduate and overlap from lighter to darker shades. The dense quilting made blocking essential and the laser square was a big help during this step, too. Soon the binding was attached and all I needed was a sunny day for photos! Well, that didn’t happen, but I did get my entry submitted. That looming deadline sure helped this quilt get finished! It was challenging and I spent way more time on the floor than was good for this old body, but it helped my skills evolve. 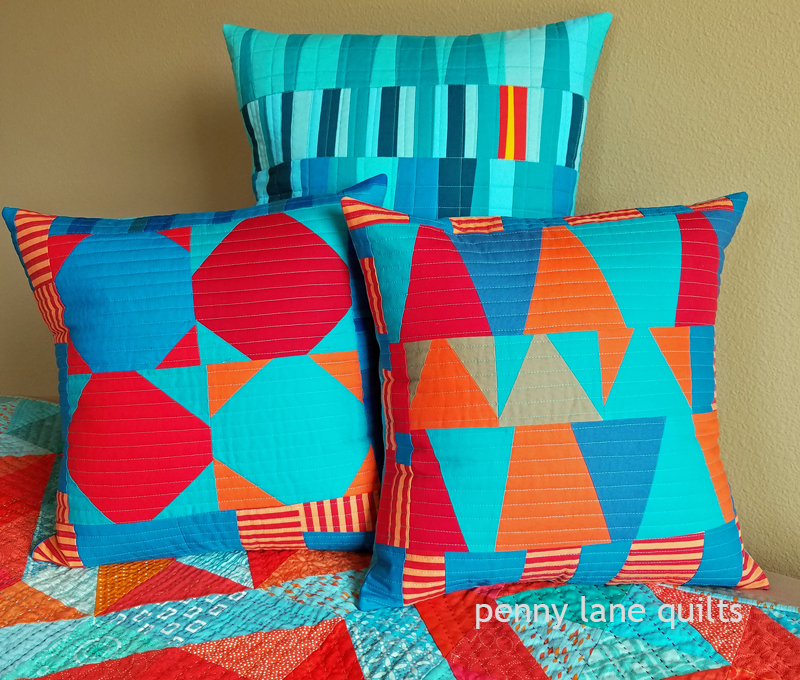 I love this quilt and it really felt good to finish a large quilt…it’s been awhile. 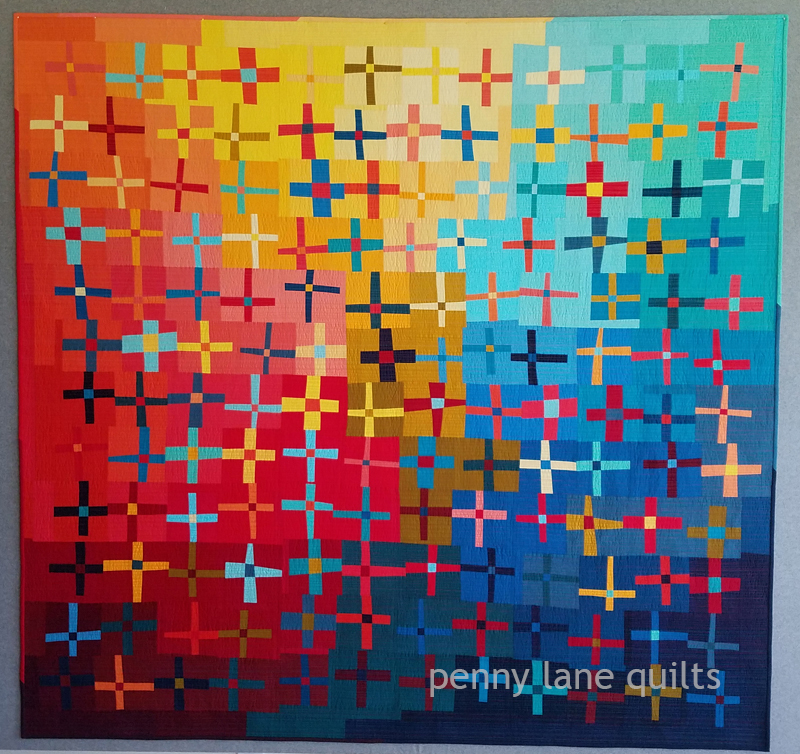 I’m looking forward to attending QuiltCon, meeting up with friends and being inspired by all the modern quilts on display. Maybe I’ll see you there?